The entry of Honda CB160 in the above-150cc bikes segment has fuelled the competition with its rivals. We have compared it to know how well the Honda CB Unicorn 160 is poised against its rivals...!!! The Honda CB Unicorn 160 is powered by a 160cc air-cooled engine powered by HET, which produces a good 14.7 Ps power & peak torque of 14.61 Nm. It is however, less powerful than the Apache RTR 160 which has highest power of 15.21 Ps. The power & torque values of the Unicorn 160 & that of the Gixxer’s 155cc SOHC engine powered by SEP are almost equal; however, the Unicorn’s engine has little more torque than the rest of the bikes. This engine is mated to a 5-speed gearbox, which common to all. All the bikes compared here have moderate fuel efficiency in the 60-64 Km/L range. Fitted with a 12L fuel tank, the CB Unicorn 160 returns an estimated mileage of 62 Km/L* under test conditions. 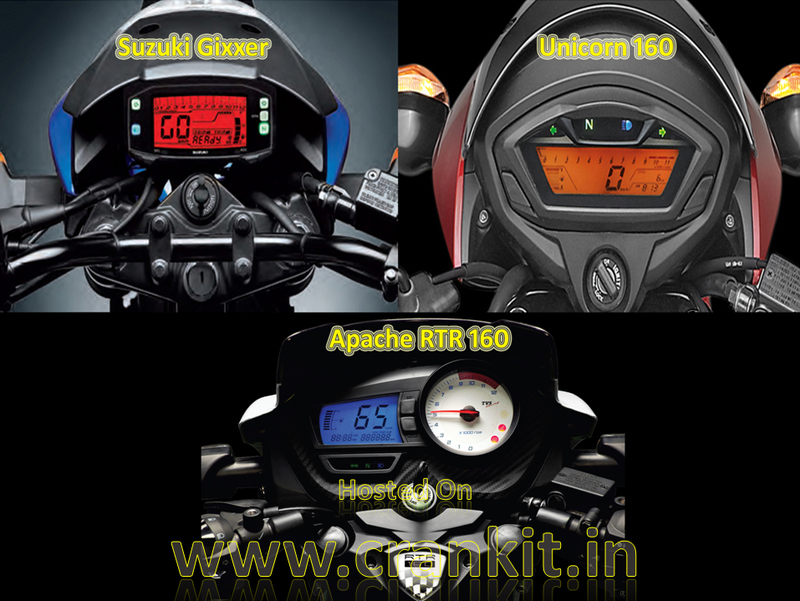 Apache RTR 160 gives 60 Km/L*; Suzuki Gixxer returns 64 Km/L*. The Honda CB Unicorn 160 weighs only 135kg same as Suzuki Gixxer, while Apache RTR 160 weighs 137 kg; 2kg heavier than the two. All three bikes come with a hydraulic-telescopic front suspension. The rear suspension of the Unicorn 160 is spring-loaded hydraulic (mono-shock), Suzuki Gixxer provides a swing-arm mono suspension, whereas the TVS Apache RTR 160 both provide Nitrox suspension with two shock absorbers option. The Unicorn 160 (STD) provides front brakes with a 240mm disc but it is considerably smaller than the Apache 160 which has 270mm front disc – the biggest among the three. Apache RTR 160 & Unicorn 160 both feature a 130mm drum for rear brakes. However, the Unicorn 160 CBS is also available with Combi-Brake System as an option. All three bikes provide tubeless tyres. Apache RTR 160 has a 90/90 x 17" Front & Rear 110/80 x 17" (both Tubeless) tyres. The Unicorn 160 provides a tubeless tyre of size 80/100-70 for the front, which is smaller than the Gixxer which also gives a tubeless 100/80-70 on the front. The rear tyre of the Gixxer is bigger & also a tubeless with size 140/60-R70. All the three bikes are entry-level sports bikes with matching styling. Apache RTR 160 is styled with striking ‘Beast-Inspired’ headlamps. It also features an LED light guide combined with new pilot lamps which mimic a pair of an animal’s eyes. Apache’s body includes ‘Muscled’ fuel tank, Engine-cowl & Tail-cowl, giving it a muscular looks. The Suzuki Gixxer features a tad simple headlamp & provides an LED display in the dash which has a digital speedometer, a bar type fuel-gauge, gear indicator, a clock and a rev-redline warning flasher. It even displays the eco and power modes. The Gixxer also features a stylish ‘Twin Exhaust’ design which gives it a macho look, whereas the exhaust pipes of the Apache and CB Unicorn are a simple single-pipe design. The Unicorn 160 features a projector headlamp with an intelligently designed ‘H’ shaped LED tail-light. Unicorn also gets a newly designed instrumental console and also provides both Tachometer and a Digital Speedometer in the dash. Honda has priced the Unicorn 160 lower than the Gixxer and Apache RTR 160. However, among the three, the apache RTR 160 has a stylish sportier looks, Unicorn 160 bears more matured looks, whereas the Gixxer has a muscular looks and provides a little more value for money. All the three bikes are almost equally poised against each other in features and performance, so it is not easy to choose a clear winner.